"GHOSTBUSTERS ECTOMOBILE OWNER'S WORKSHOP MANUAL"
I thought that this was an odd choice for a manual, after all the previous Star Trek, Star Warsand Captain Scarlet manuals had a lot of vehicles and equipment to choose from, Ghostbusters has pretty much one car. How wrong could I be? 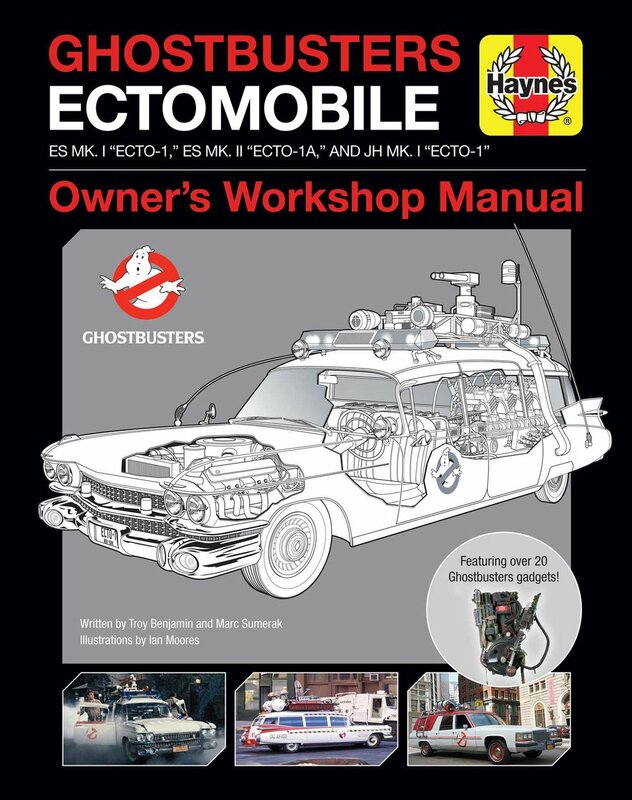 The Haynes Ghostbusters Ecto-1 Workshop Manual is super cool. It's both a fun read for fans as well as a valuable resource for Ghostbusters prop builders. In addition to having info on the original Ecto-1, the Ghostbusters 2 Ecto-1A, and the reboot Ecto-1, the book also includes detailed specs for 20 Ghostbusting gadgets across the three movies. I really liked how the book isn't supposed to be written by Ray Stanz, but it still feels like it is. The tone and grammar and word choices feel very much like they're coming out of his mouth. For that in-universe flair, some pages have sticky notes with comments and quips from members of both Ghostbusting teams (original recipe and lady-style). On that note, this book treats the reboot Ghostbusters as characters in the same universe as the original team. It suggests they're a modern franchise carrying on the business founded in the '80s rather than a team existing in a universe completely separate from the original films. I wish the 2016 movie had gone that route. I would have loved for it to be a new story with new Ghostbusters with all the rich history of the original universe instead of a completely new "inventing what Ghostbusting is" story. But I digress. The book did a fantastic job balancing in-universe with real-world facts. For each device and gadget mentioned there was a detailed Ghostbusters-world rundown of exactly what the thing does, and many of them also include details of what real-world devices were "repurposed by Dr. Spengler" to create them. For example, the entry on the PKE meter explains how it's used to detect ghosts, and also mentions exactly what kind of electric shoe polisher the prop is made of. A great deal of effort and love clearly went into this book. It's definitely worth a look from any Ghostbusters fan, old or new.